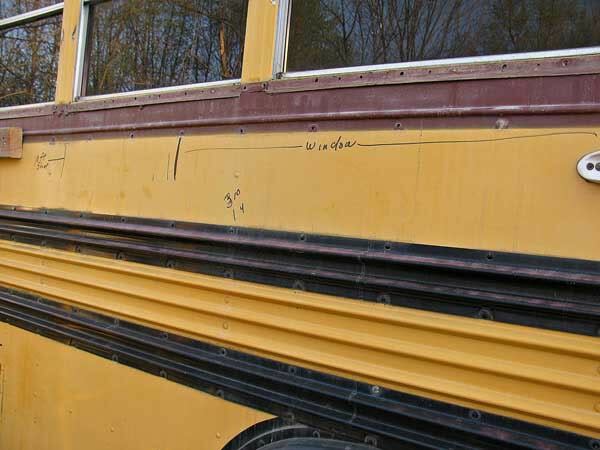 School Bus Conversion Resources - Anyone removed the Ridged Rub Rails? What's behind there??? Anyone removed the Ridged Rub Rails? What's behind there??? Let me guess... I thousand new holes to deal with? The tops of the Rub Rails are Screws - the bottoms are Rivets... Any got any photos? I can't say what's under the rails of a Thomas, but here's what's under the top rail of a Bluebird. No screws, all rivets. There isn't really any framing on the inside, the rail is pretty much it. As you can see there is another rib in the skin under the top rail, and that window frame bottom is pretty nasty. The skin between the second and third rub rail has the corrugations "built in". Unless you were going to remove everything and put new smooth skin on I don't think you would gain much as far as looks go, and you would lose a lot of side strength. We have a Blue Bird. I viewed the rub rails like architectural details and picked them out with paint like you would with a Victorian Painted Lady. We had no intention of removing them. Too many rivets. On my thomas pusher, i have removed about half of the rub rails. when some of them are removed, I had to put new screws in because the seam on the lower panel joins together. On my 1991 bus, one side of the rub rail has rivets, and the other side has metal screws. Eventually I will either remove all the rub rails, when i get back to removing the rest of the windows, as i am going to build a 12' or so slide when we go to our other property.